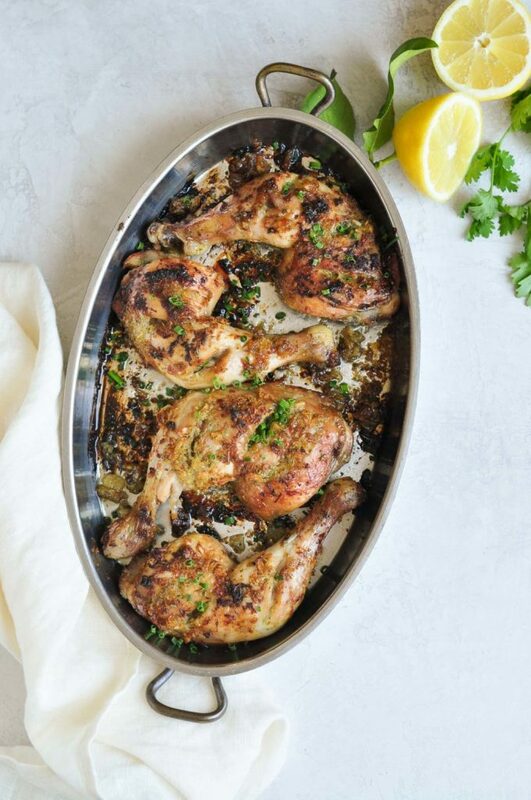 Chicken leg quarters are the perfect change of pace to your dinnertime lineup. They’re juicy, flavorful, and tender, but let us not forget the best part — that beautiful, golden, crispy skin. This recipe for baked chicken leg quarters is a must-try, and your chicken is guaranteed to be perfectly cooked and exploding with flavor the moment it comes out of the oven. The best part? The prep work is extremely minimal and this is one easy dinner to slam out. In addition to a simple method for baking up a batch of perfect leg quarters, we’ll also cover why rosemary and lemon will take your chicken to the next level, as well as the simple time and temperature combo for baking up golden-brown crispy leg quarters without fail. 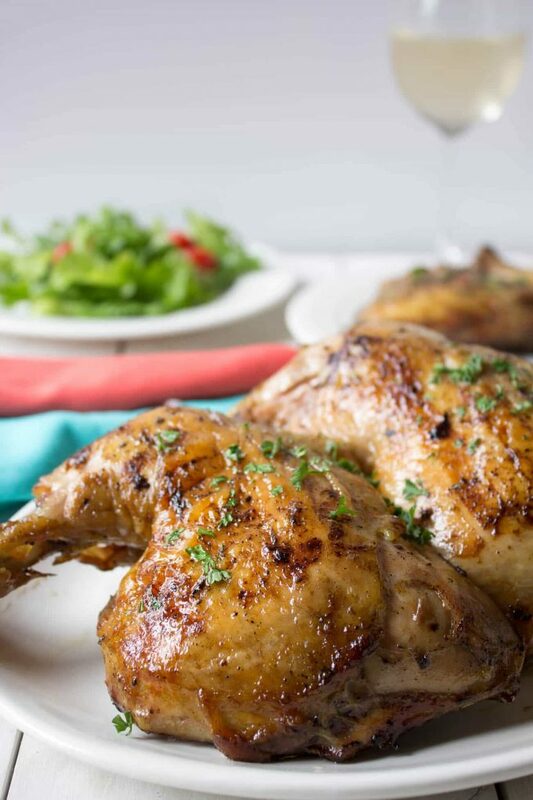 Chicken leg quarters may look intimidating to those who haven’t worked with them before, but just like a whole-roasted chicken, all you need is a little know-how and a whole lot of flavor, and you’ve got one more scrumptious staple to add to your dinnertime lineup. If you’ve ever had a perfectly baked chicken leg quarter, you know getting this recipe under your belt will be well worth it. WHAT ARE CHICKEN LEG QUARTERS? Chicken leg quarters are the thigh and drumstick of the chicken, which means this is a dark meat cut. Typically when you butcher a whole chicken, you separate the thigh and the chicken. However, in the case of the leg quarter, you leave them attached to one another. This creates an impressively sized hunk of chicken and one that makes one heck of a dinnertime entree. WHY ARE CHICKEN LEG QUARTERS SO CHEAP? If you’re wondering why chicken leg quarters are such a marvelously economical cut of bird, it’s likely due to the fact that there is less butchering involved on the processor’s end. Ever noticed you can get a whole chicken for almost the same price as boneless, skinless chicken breasts? It’s more than double the meat, yet the price doesn’t reflect it at all. The leg and thigh are still attached with the skin on when you purchase chicken leg quarters. This means more meat and more flavor for you, along with a smaller price tag. This is a win-win, people. These crispy, baked chicken leg quarters are seriously easy to make, and if you’re looking to the lemon zest and freshly minced rosemary and stick with the basics, that’s no problem at all. You’ll still end up with a juicy, flavorful, tender baked chicken leg quarter the entire family will swoon for. Pat leg quarters dry with a paper towel. Preheat the oven to 400° and prepare a rimmed pan with rack. Combine butter, oil, fresh herbs (if using) and seasoning in a small bowl. Spread the mixture across chicken leg quarters, and sprinkle with additional seasoning. Bake 40-45 minutes, until chicken reaches 175°- 180°. Allow to rest 10 minutes and serve! Before you add the seasoning to the chicken leg quarters you should first pat them dry with a paper towel. This helps to remove any excess moisture from the chicken and allows for the butter mixture to better adhere to the skin. When it comes to chicken leg quarters with crispy skin, it’s all about oil, temperature, and time. Without a coating of oil (olive oil in this case) your chicken wouldn’t develop that beautiful, golden brown exterior. Butter also helps the chicken along when it comes to browning, and gives it a great deal of flavor. Baking the chicken at 400° for 40-45 minutes is the perfect combination to create a crispy, baked leg quarter you just can’t help but sink your teeth into. WHAT TEMPERATURE ARE CHICKEN LEG QUARTERS DONE? Baked Chicken Leg Quarters are done once they reach an internal temperature of 180°. However, the chicken will continue to cook even after it comes out of the oven, so you can safely pull it at 175° and the temperature should reach its final destination after resting 10 minutes or so. HOW TO CUSTOMIZE YOUR OWN RECIPE! You can easily take this recipe and make it your own. As we discussed earlier, the addition of fresh rosemary and lemon zest are optional, as is the seasoning. You can use just about any combination of herbs you like, as well as your own favorite poultry blend. To customize your own chicken leg quarter recipe, simply omit the herbs and spices from this recipe, and use your favorites in their place. However, for best results, be sure to keep all other aspects of the recipe and process the same. Everyone loves a good chicken leg quarter recipe, the sheer size of them alone is impressive. But, when you can make a crispy, baked chicken leg quarter this good, the flavor is what’s really impressive. That and the fact that they’re perfectly crispy on the outside, yet succulent and juicy on the inside. It’s a family dinner your crew will adore having added to the lineup, but also a very economical choice for a dinner party! They present beautifully and save you a pretty penny all at the same time. Please, enjoy. BBQ Baked Chicken Quarters are easy to make and perfectly cooked. Simple, baked leg quarters brushed with BBQ sauce! Baked Barbecue Chicken features perfectly cooked dark meat chicken (both legs and thighs) coated in a sticky, sweet BBQ sauce and baked to perfection. Perfect Pan Seared Chicken is simple, easy, and cooks up quick! It’s perfect for a healthy dinnertime entree and great for topping salads. Parmesan Crusted Chicken Tenders features budget-friendly chicken strips coated in a crunchy Parmesan-Panko crust and baked. Serve them with marinara for dipping as an extra special touch! Smothered Chicken with Bacon, Cheese, and Honey Mustard is the perfect way to dress up chicken breasts. It’s great for weeknight family dinners, loaded with flavor and the perfect balance of savory sweet! Baked Chicken with Ranchero Sauce is healthy, easy to make, and super flavorful! Chicken Breasts are topped with Monterrey Jack Cheese and baked in sauce. Serve with sliced avocados and corn tortillas. Chicken Scallopini is a must-make, Italian restaurant classic featuring thinly sliced, golden chicken cutlets drenched in a buttery lemon sauce with capers. 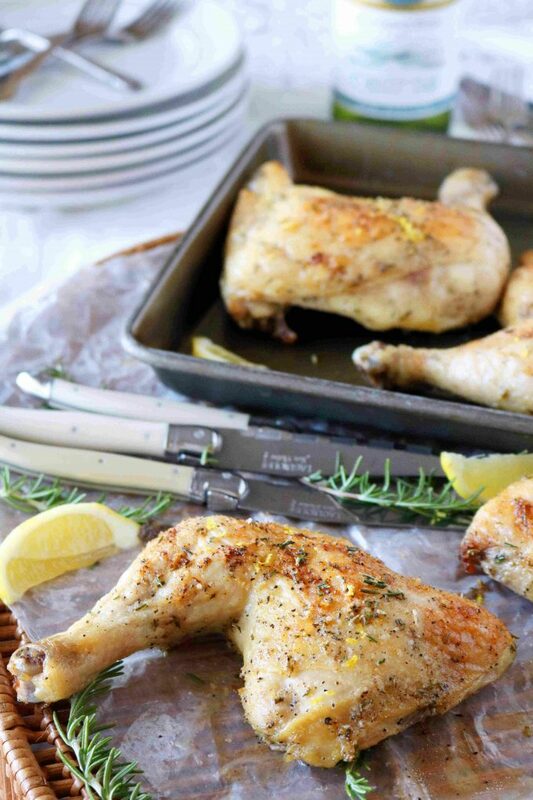 A baked chicken leg quarter recipe for perfectly cooked, flavorful leg quarters coated in butter and olive oil, and seasoned with fresh rosemary and lemon zest. Preheat the oven to 400°. Pat the leg quarters dry with a paper towel and transfer them to a rimmed baking sheet fitted with a rack on top (an oven-safe cooling rack works fine). In a small mixing bowl, combine the butter, oil, rosemary, 2 teaspoons Kosher salt, black pepper, garlic powder, onion powder, and lemon zest. Whisk until well combined. Spread the mixture generously all over the leg quarters, then sprinkle a 1/4 teaspoon Kosher salt evenly across the top of the leg quarters. Bake for 40-45 minutes, or until the internal temperature reaches 175°-180°. Allow to rest 10 minutes, serve and enjoy. Roasted Cast Iron Chicken from Dude That Cookz is looking about as crispy as they come. 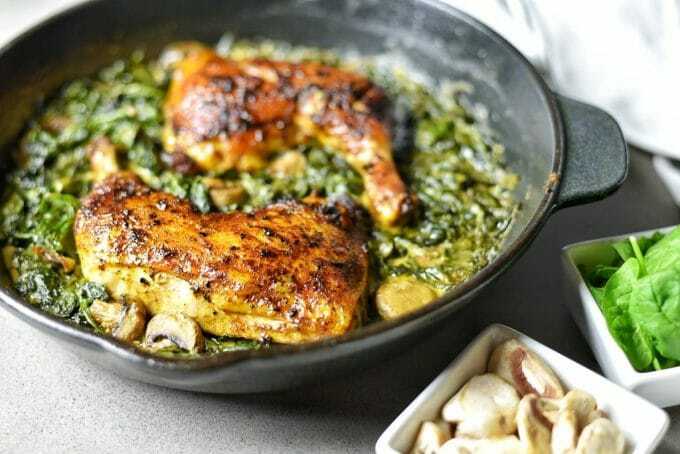 It features pan-seared and baked chicken leg quarters accompanied by a bed of wilted spinach and mushroom. A savory combo made in heaven. I’m also obsessing a little bit over Beyond The Chicken Coop’s Beer Basted BBQ Chicken. It features chicken leg quarters basted butter, beer, rosemary (see? 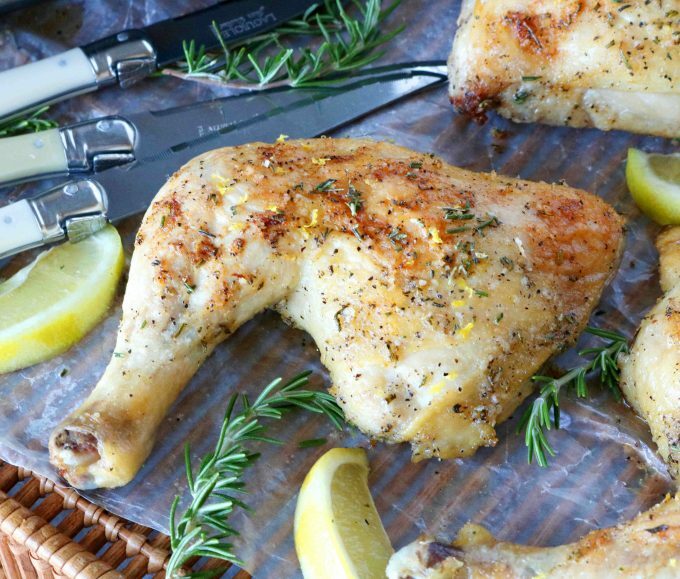 everyone loves rosemary and chicken), and garlic and grilled to perfection. 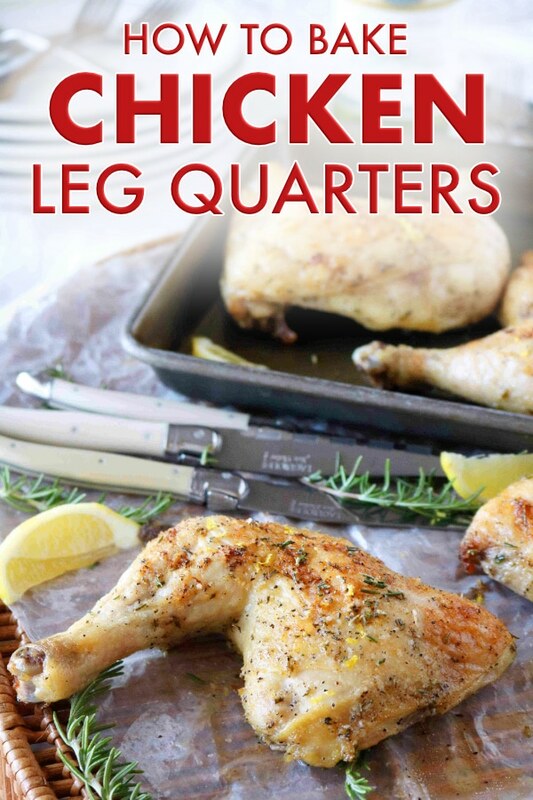 A perfect leg quarter recipe for summertime eats! Eat Little Bird’s take on leg quarters has a Thai spin with notes of lemongrass, coriander, ginger, and chilies. Yes, please. I have literally never bought chicken quarters before. But now that I know how easy they are to make, I will definitely give them a try later this week. Those chicken leg quarters look so crispy and delicious! 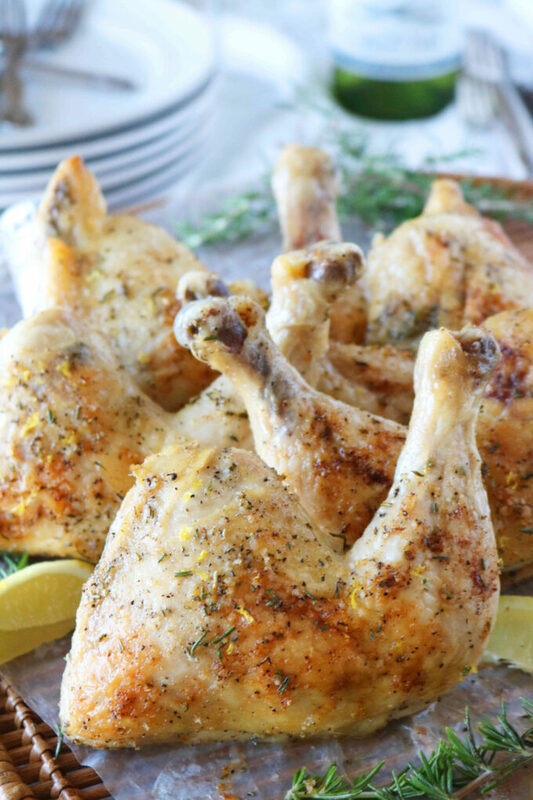 I also love flavoring chicken with lemon and rosemary so I would love to try this recipe! Legs are my favourite part of the chicken to cook with! I also love roasting them and use rosemary, garlic and butter. Never thought to add lemon zest. Love the idea. Must try your recipe! You can never go wrong with a great, classic chicken recipe like this. I’ve been meaning to harvest some of the rosemary from my garden. This will be the perfect recipe to use it in! I haven’t used the technique of patting my chicken dry before cooking yet but I’m definitely going to give it a go next time I roast chicken in the oven. These look incredible! I’ve never baked a whole chicken (even though I’ve done multiple turkeys so you’d think chickens wouldn’t scare me so much), so this recipe seems like a good place to start! Thank you for the super detailed cooking instructions! 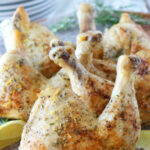 These chicken leg quarters look yummy and I love rosemary in my baked chicken. Fantastic chicken recipe that can easily become “the favorite”! That skin must be so crispy – I can imagine hearing the sound as I take the first bite – deliciousness! I can see why someone recommended me this recipe – those juicy chicken legs look extremely delicious. And because I was told this recipe was perfect, I can’t wait to try it mysef! 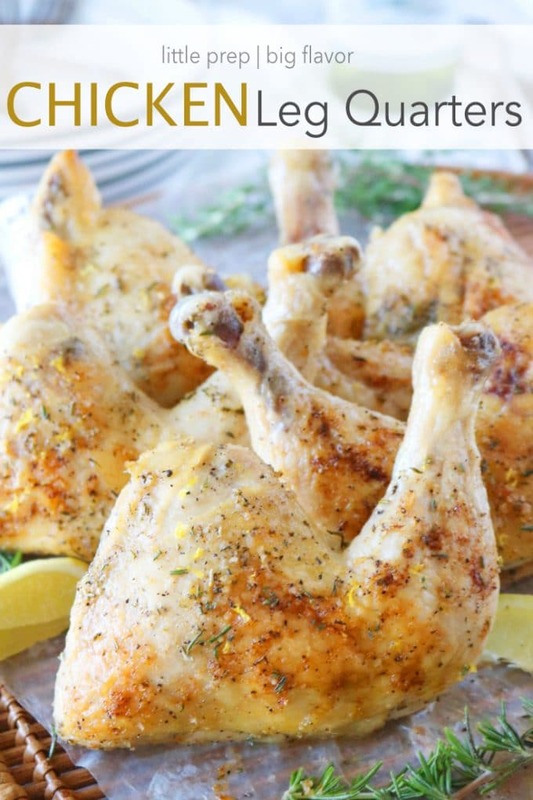 Chicken legs are my favorite part of chicken and these look so juicy and yummy. I am sure it would be a hit at my place 🙂 Thanks for sharing this delicious recipe!! !